I have another baking book up for review today! 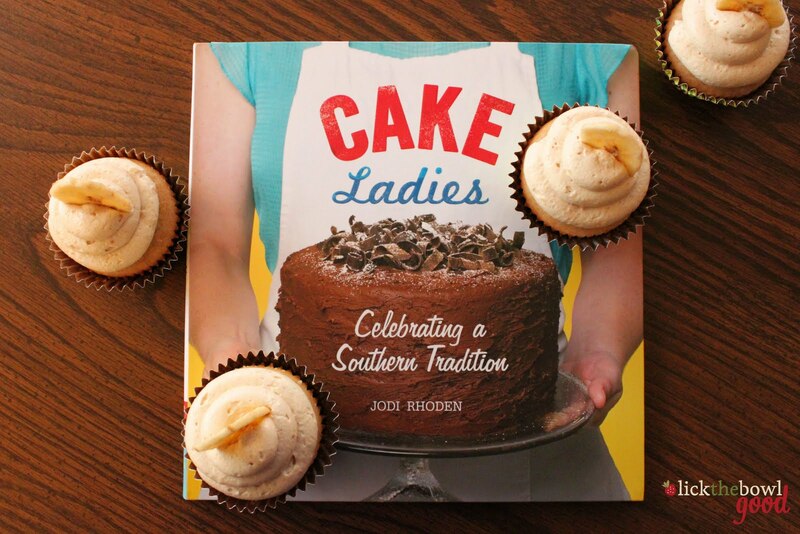 This time it's Cake Ladies by Jodi Rhoden. This book appealed to me immediately because I consider myself to be somewhat of a cake lady. "What is a cake lady? ", you may be asking yourself. Everyone may have a different definition, but to me a cake lady is a woman who bakes cakes to make people happy. Sometimes they bake to make ends meet, sometimes it's a creative outlet, and sometimes it's to feel a part of a community. All the ladies in this book come from different backgrounds and have their own story, but they all believe in the healing powers of cake. They all love cake. I love cake. Do you? Are there really healing powers in cake? In a way, I believe there is. A homebaked cake sitting on the counter makes an ordinary day better, they put smiles on faces. There's a reason they're always present at birthdays, weddings and showers. It's like a gift wrapped up in sweet buttercream and piped rosettes. Okay, enough about cake and more about the ladies who make them. This book shares the stories of 17 women- from bakery owners in Georgia to a midwife in North Carolina who bakes for the new babies she delivers to sisters in New Orleans baking vegan and sugar-free cupcakes for the community. I read this book while soaking in a hot tub. I got so wrapped up in it that I had to rewarm the water an hour and a half later. 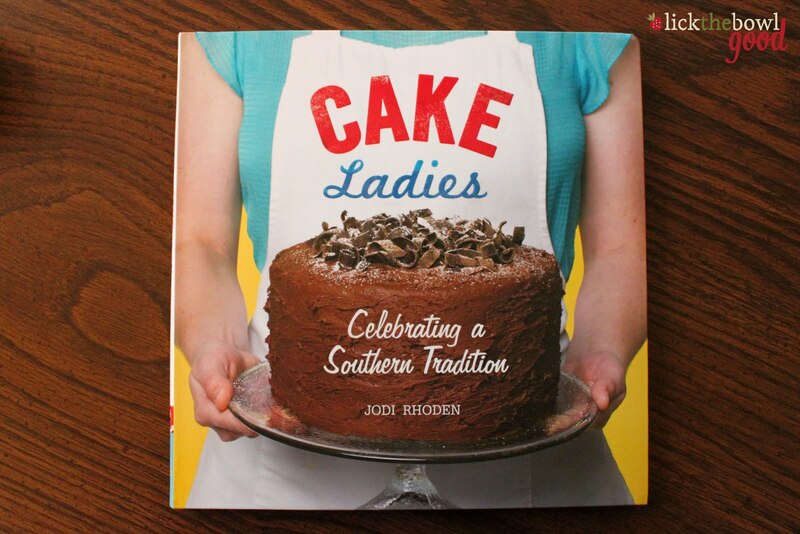 The cakes that are shared in this book are all the prized recipes from these ladies. 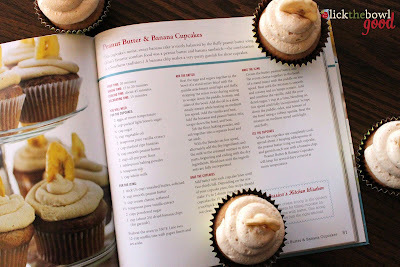 I chose to bake the peanut butter banana cupcakes, because I adore that combination. I really enjoy a PB and banana with honey sandwich and these cupcakes were very similar in flavor. The cupcake itself was dense and moist and the peanut butter cream cheese frosting was so light and fluffy. I also plan to make the chocolate cake on the cover- a request from Mr. H and a white layer cake slathered in lemon curd. That one is for me. Yum! The only downside I saw in this book is that the author, Jodi Rhoden, who is a cake lady in her own right didn't share a recipe of her own. That would have been the perfect addition to this book. Otherwise it was a great read, informative and all the recipes are accompanied with full size color photos. Preheat the oven to 350 degrees . Line two 12-cup muffin tins with paper liners and set aside. For the Cupcakes: Beat the eggs and sugars together in the bowl of a stand mixer fitted with the paddle attachment until light and fluffy, stopping the mixer twice during mixing to scrape down the paddle, bottom and sides of the bowl. Add the oil in a slow, steady stream while beating on medium low speed. Add the vanilla and beat. 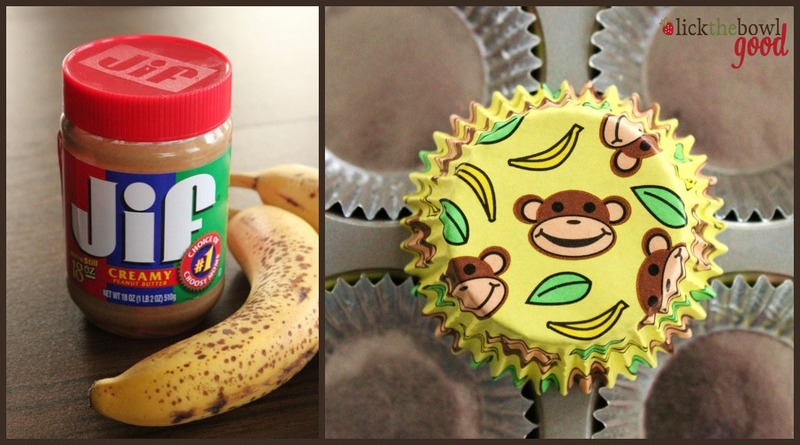 Add the bananas and peanut butter, mix, scrape down the bowl and beat. Sift the flour, baking powder, and salt together into a separate bowl and set aside. With the blender on low speed, alternately add the dry ingredients and the milk to the creamed mixture in three parts, beginning and ending with the dry ingredients. Blend just until the ingredients are fully incorporated. Add batter into each cupcake liner until two-thirds full. depending on the size of your cupcake pans, this recipe should make about 2 dozen cupcakes. Bake cupcakes for 15-20 minutes or until a toothpick inserted in the center comes out clean. For the Icing: Cream the butter, peanut butter and the cream cheese together in a bowl of a stand mixer with a paddle attachment on low speed. Beat until the mixture is smooth and cream and no lumps remain. Add and combine the vanilla. Add the powdered sugar, 1 cup at a time, blending on low speed until fully incorporated. Scrape down the paddle, sides, and the bottom of the bowl using a rubber spatula. Beat the mixture on medium speed until light and fluffy. Icing the Cupcakes: When the cupcakes are completely cool, spread or pipe about 2 heaping tablespoons on the peanut butter icing on each cupcake, then garnish each one with a banana chip. Cupcakes will keep several days covered in the refrigerator. Want to win your very own copy of Cake Ladies? Leave a comment on this post telling about a cake lady that you may know of, or simply tell me about your love of cake. It's that simple. One winner will be chose and the publishers will send a book out to that person. Giveaway valid in the USA only. Please leave contact info when leaving a comment. The giveaway is closed, the winner is announced HERE. Annie from Annie's eats is a "cake lady" that has inspired and encouraged my love of baking. I don't her personally, but her cupcake recipes and photos are beautiful and alluring. I've also been pleased to find a source of recipes which I can count on to be top notch!! Those cupcakes look devine!! Our 32 year old daughter is the most talented "cake lady" I know. I use to decorate wedding cakes and she started copying me from a very young age. She has now FAR SURPASSED my talents. She is so good at it and imaginative!! Although I'd love to have this cookbook for myself, my friend Cassidy is the first person who comes to mind when I think, "cake lady." She loves to create and decorate unique and delicious cupcakes and cakes. As a recent wedding gift, she even gave us the gift of "a cupcake of the month" for a whole year. Every month, 8 amazing cupcakes are hand delivered to my house! What a treat! I guess I am the only cake lady I know. I love to make cakes especially for my hubby,kids,and grandkids.I have made cakes for others but I still love to make them most for my loved ones. I would love to have a copy of this. My friend bonnie is a real cake lady...when she sees a recipe for a cake she wants to bake she can't get it out of her mind until she bakes it. My favorite Bonnie treat was chocolate cupcakes with ganache filling and vanilla/chocolate swirl frosting. They were very rich and so divine! She is my great friend and will be moving across the country in 2 days! : ( This would make a great gift for her! This sounds like a great book. I love when you can just sit and look through pages and pages of recipes. I don't know any cake ladies, and I don't consider myself a cake lady (even though they are fun to bake and eat- just not decorate and frost; it's frustrating)But I do love cake. Especially the moist ones that get even better with milk...mmmm cake. I'm definitely the cake lady in my family. I'll bring a cake or cupcakes to any gathering! This book sounds awesome! lauwil07 at gmail dot com. This lady at our church, Lilah, makes the best cakes and even though I follow her recipe, my buttercream is never as good as hers! But trying to get mine up there with hers does make for some yummy practice! I'd love to win this book. I'm a cake lady too, nothing beats homemade either! I'm also the muffin mama at church! This looks like a yummy cookbook, please add my name! Thanks! My mom was the Cake Lady in our family. I loved her chocolate cake, it was the best. Let me get this out in front from the very beginning, I am not a cake lady, or any kind of lady at all. I take that back, I was a lady in a high school play, but that was a half baked effort. I am a 60 year old man who loves to bake cakes. I tend toward dense cakes but I believe any cake will do when I have a sweet desire. I guess I inherited it from my mom who constantly baked cakes for other people. She preferred light cakes, chiffons and sweet breads like babka. My daughter is now baking for friends and neighbors and I would love to send this along to her. I like cakes because when a cake is served I know it will be enjoyed with good company. Cakes = birthdays, weddings, baby showers, Thanksgiving, Christmas, and dinner parties. I love making cakes because they are typically not as tedious as cupcakes or cookies, but they still serve a ton of people. Our preacher's wife is quite the cake lady. Any time the youth group has a fundraiser like a bake sale or dessert auction, she bakes at least 3 or 4 cakes (not to mention other goodies). Any time there is a need to feed a crowd such as a funeral or happy occasion, she is willing to help with a cake or two. Did I mention they're extremely delicious? She's my favorite cake lady for all of these reasons. Mmm...cake my favorite. I love making birthday cakes and wedding cakes. My favorite is devils food cake with ganache frosting! I so rarely make cake. Cupcakes are more frequent in my kitchen just because they are easier to distribute at work and don't require plates of forks. But cakes are so beautiful! My favorite is funfetti - I keep meaning to make it from scratch. My sister-in-law, Dawn, is an amazing "cake lady." She made our wedding cake and she's always making cakes and desserts for every occasion! This is a great giveaway and I found myself smiling while reading your description of what makes a "cake lady" and I nodded in agreement about the happiness a cake-on-the-couner conjures up. Those cupcakes look yummy! I would be the cake lady in our family. I love making cakes almost as much as I love eating them! The cupcake look wonderful! I'm a cake lady too - love to make cupcakes! My Grandma was a cake lady and would make her famous banana cake with 7 minute frosting for every family get together. I made it this Christmas in cupcake form in remembrance of her. My Dad loved it! My favorite cake lady is my Aunt Jeanne. She makes the cakes for ever one's birthday, wedding, event, etc. Her decorating skills are impeccable and her cakes are so great tasting! We have a family cake recipe that has been passed down for so many years I am not sure any of us even know who the cake is named after. But it is my favorite cake lovingly named an Aunt Isabell cake. It's yummy but I have no clue who she is. I used to be the "cake queen" in the family, but I have passed on the crowns to my daughter, who makes our wonderful Yule Log each Christmas, and my daughter-in-law who bakes everything from scones to cookies to muffins. My grandmother was an excellent cake baker. But I remember a little old man who used to come fishing in our little pond and his wife made THE best pound cake. I would love to win this book. Thank you. My mom is my favorite cake lady! My second is my grandmother. LOVE to walk into a house and smell fresh baked cakes! I'd love to win this! Yummy! don't know any "cake" ladies but i do love cookbooks that mix stories about the bakers w/ their stories. My mom is MY cake lady! She has been making me 'Jello Cake' every year for my 41 yrs of life :-) Wouldn't be my birthday with out it! I am the cake lady for my family...they are never really pretty but most of the time they are yummy! Sounds like a great book for the Cake Slice group. I like being the cake lady, there is nothing like giving a cake to someone and seeing them smile. I will have to try this recipe, my son's favorite sandwich is also peanut butter & honey with banana. I think I may be considered a Cake Lady. I love baking and use any opportunity to share my creations. Making a cake for someone is my way of saying "You are loved". I am a cake lady through and through (and a cake eater). Just love to bake cakes. I enjoy making cakes for other people. But my favorite so far as been the chocolate pb cake I made for my birthday two years ago. Mmmm! I come from a whole family of cake ladies! My mom and grandma have made many of amazing cakes and now I've gotten the bug! I love being able to put a cake on my cake stand, it just makes the whole kitchen and living room look prettier-and tastier! My mom was the Cake Lady, and now both my sister and I are Cake Ladies and love to bake and share treats. I would love to share the book with my sister! Thanks for the opportunity. I consider myself the cake lady. I love to bake birthday cakes for family and friends. It doesn't seem so accepted to bring a cake into a restaurant for a birthday party, but I think it's special. I'm the cake lady in my family. I love to bake! My favorite cake is carrot cake. My Aunt Laura was our cake lady. My mom was the cook and she was the baker. She made the best cheesecake. I would love this book. Your cupcakes look as good as any in the book Monica. I love baking the forgotten cakes, the cakes that were made years ago. They aren't really fancy cakes but they are all so good! I love to make cakes and any day is spaecial for me to make cake o other kind of treats. I wish I can win this book so can inspired me more to make professional cakes. I'd like to think I'm a bit of a cake lady, but I'm probably not. However, I do really enjoy making my grandmother's carrot cake. Each year, on December 30, in honor of my grandmother and my mom's birthday, I make this delicious treat. My mom isn't usually one to show emotion, but since Grandma's passing, this cake always brings a tear to her eye. Maybe this cookbook will help me to become more of a cake lady...like my grandma! I know a lady in church who makes wonderful cakes and makes them for every major event for the church. She is very talented. Thanks for the chance to enter. My sweet Southern grandma is my cake lady, and I'm her cake granddaughter! I love making cakes and I'm sure I eat far too many of them but you're right...they just make the day better. Thank you for hosting this great giveaway! My daughter is 26 and she is becoming my go to Cake Lady or should I say Cup Cake Lady. Who would have thought my daughter would buy a hole assortment of cooking utensils and baking items for her first apt rather than a couch! Go Cake Ladies! I would love to win this book for her! Cake...it doesn't get better than cake! I am obsessed with cake and not ashamed to admit it! When I bake it is gone almost immediately because it becomes breakfast, lunch, and dinner & the in between snacks! My 8 year old granddaughter is a future cake lady! She is learning to bake cakes and cupcakes and has even earned some spending money by making cakes for parties! She's quite a girl! Cake? Who doesn't love cake? I love to make them and give them away more than I love eating them ! DH loves a chocolate cake, and I, like you, prefer lemon, banana, white ....yum ! When I got married, almost 10 years ago at just 18 yrs old, I dreaded every birthday or holiday that would need a cake. I had a black thumb when it came to baking cakes and decorating them! (pies and cookies I enjoyed tho)Now 10 years, 6 chilren, & soon to be 50 birthdays later, I actually enjoy the challenge of a birthday cake. She should sell her cakes, to help her make ends meet, but she says that would take out all the love she puts in her cakes. This book would be for her! My sister and I are both the go to cake ladies for all of our family parties and holidays! My mom used to be a cake lady. She would make beautiful decorated cakes for all of my birthdays. She made great cakes for my grandparents birthdays and 50th wedding anniversary. Sometimes she even made cakes for money. When she started working full time when I was in high school she stopped making so many cakes. Now I only occasionally get one for my birthday. I hope some day to be half as talented as she is. I used to be the cake lady in my teens :) I'd like to get back to that and I'm doing it small steps here & there. I do bake for certain birthdays - like my employer's wife. She says the family counts on me to make her cake, so what can I do? Keep baking, of course! :) Thank you for the chance to win! my son was a fabulous chef. we lost him 3 years ago. every year on the anniversary of his death, we celebrate his life. we, as a family, and friends get together and make many cupcakes and give them to a couple of local shelters. cupcakes always make you smile ...my son made people smile when they ate his food. a tribute to him. My sister is a great cake lady. Her specialties are chocolate, coconut and red velvet. I prefer to make pound cakes....much easier. I love carrot cake and caramel cake. Unfortunately, I resist making these because I am the one who likes them the most...too dangerous. I end up making chocolate, which I don't like as much!! When I think of a cake lady you are the first person that comes to mind as your work is always clever and beautiful. A close second would be the Food Librarian with her love of the bundt! I think I'm becomming a "cake lady"!! For 20 years, I made the typical 9x13 pan cake with easy frosting. I made the typical Bacardi Rum Cake. Now after all these years I have more confidence and have been tackling 3 and 4 layer cakes with fillings frostings and toppings! I've even posted a few pics on my facebook page and people actually ask when they can come to my house for cake!! So, I'm having fun!!! Oh my gosh, I've known a cake lady for over 35 years now. Ive gone to her for cakes for everything from office parties to my wedding. Not only are her cakes super delicious, but they are beautiful. She baked them out of her house and eventually had a giant add on simply to do her cake baking. It basically was a kitchen simply designed for her cakes. We live in another state now, but I'm pretty sure she is still baking her cakes. I live in what's considered a high altitude area, so success can sometimes be a bit precarious. I love making cakes...I'm a born baker. Many years ago, when I was still a young newly wed, I was living in Dallas, TX with my then student husband and I wanted to surprise him when he came home from his weekend job. I decided to make a 4 layer cake, an endeavor I had never dreamed of trying here in my hometown. My excitement mounted as I began layering the cakes with my own frosting recipe, back then, there were no pre-packaged frostings. I called him up since I couldn't contain my enthusiasm. I told him I had made a 4 layer cake, then the first layer began slipping off into the sink, ok, a three layer cake, there went the third layer...so I told him I hope he enjoys his friggin' two layer cake and hung up!! I just found your blog via pintrest and I am a lover of cake. My grammy is a cake lady. Cold Chocolate Cake is the bomb. Thanks! It has to be my daughter, she is not afraid to tackle any kind of cake. And the outcome is always yummy. My daughter is definitely the cake lady! my mother-in-law is a cake lady who can make the most awesome poppy seed cake & than turn it into a beautiful wedding cake - wish I could do that! Great giveaway - would love to win! It has to be my work friend Nancy who is definitely the cake lady in my life. She introduced me to the yummiest Pumpkin Bars with Cream Cheese Frosting (now a favorite of my family too). She is also known for her tempting Meyer Lemon Bars which she happily share with all. Nancy willing shares her special treats anytime she receives a request and best of all she happily shares the recipes! My son's great aunt makes the best cakes and cookies. I have asked her to teach me and she graciously said she would. Unfortunately my schedule and hers has not coincided enough for that to happen. My mother is a cake lady...she loves to bake and about once a week makes all sorts of different cupcakes to take to the Wounded Warrior Project. My grandmother was the best cake lady I've ever known. She's been gone a very long time, but I cherish her hand written cake recipes and remember always making them with her as I was growing up. My mom is a cake lady! She started decorating cookies for me when I was in elementary school...apparently I asked her to make big valentine cookies, one for each kid in my class. Twenty plus years later, she makes beautiful cakes for other people. It's a hobby for her. Her cakes taste so good, too! I enjoy making cakes for other people. I am the go to cake lady for all my family parties! Those cupcakes look devine! My mom is what I consider a cake lady. She always baked homemade treats and gave them for special occasions and get togethers. Thankfully, her love of baking got passed to me. Cake is my dessert of choice! My favorite "Cake Lady" was my grandmother. She always had a cake cooling on her counter. She was the kind of southern cook that constantly made cakes, pies etc because that is what you have on a daily basis! I still have no idea how she was so tiny. Her coconut cake was to die for! I hope I am a cake lady when I get older. Oops! I left the above comment, but I had a typo in my email address. I'd say you defiantly make the cake lady cut Monica, with all the tasty cakes and cupcakes on this site! These cupcakes sound like a similar cupcake I make but chocolate version. This sounds like a wonderful book! My favorite cake is black forest cake! Im the cake lady in my family...i bake in my dreams and then bring my dreams to reality. Back in the day, my mom was a cake lady. My sister and I grew up watching her and wanting to be able to decorate cakes, so we are now both cake ladies. My grandmother was definitely a cake lady - she made the most delicious cakes for all occasions. Once she passed away, my aunt took over ... but I would love to be a cake lady myself one day! At one of the loneliest moments of my life, I was feeling unappreciated,left out and forgotten when my friend Arlene brought over an orange chiffon cake and said "thank you." It was delicious but even more so because of the love that came with it. She's inspired me to do the same for others. What a great example of the best "cake Lady!" My Great Aunt Maggie was a cake lady. She was known for her German Chocolate and Italian Cream cakes. So very, very good. I'm that cake lady, I even started my own cake and dessert business. 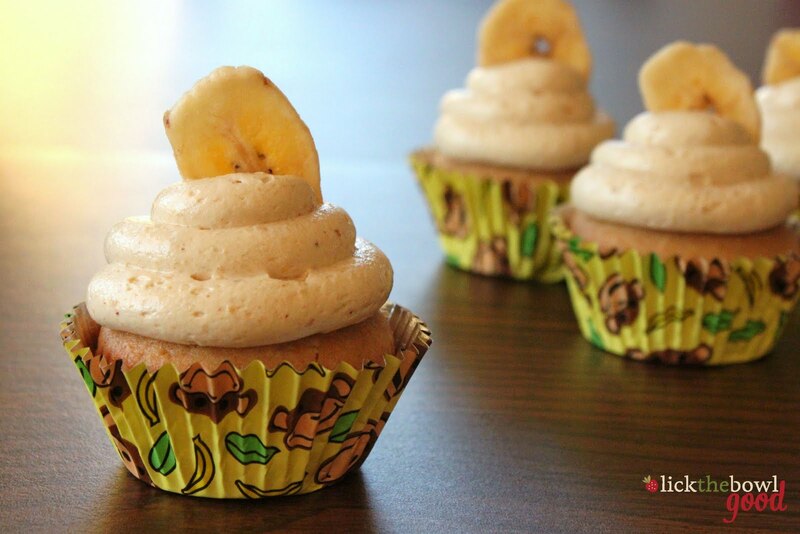 One of my favorite cupcakes to make is Peanut butter banana! This book looks like a very good read! We had several Cake Ladies in the small Southern town Where I grew up.....they're a dying breed. Hopefully, they'll make a come-back!! I love cake... my fave is chocolate cake! I should expand my baking circles because I don't quite know any cake ladies..
my friend recently moved to Texas, but she is an awesome 'cake lady'!! I love cake, especially in cupcake form! 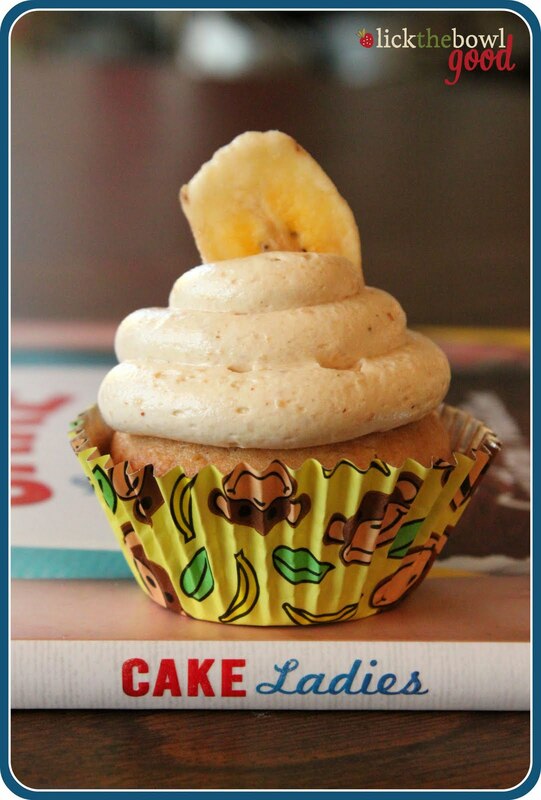 My youngest daughter and I love making cupcakes and share recipes all of the time. THis would be a fun book to share. I would have to say my firend Carlene who is self taught and learned by trial and error and does a wonderful job! Hihi would luv to get & try the cakes recipes!..I'm myself a Cake Lover..
Cake is my favorite food group! Mention cake and my attention is lost until I get a piece in front of me :) This is a great looking cookbook that I need to find! The cupcakes look "to die for"! Why is it that I love cupcakes even more than cake? I actually would consider myself a Cookie Lady, although I certainly enjoy cake too! Looks like a great book. I just love your blog header...precious!! Love all your recipes they r yummy thanks for sharing Regards Richa.